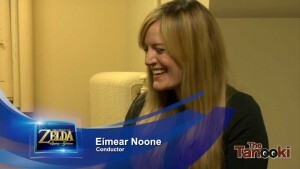 We recently reported on the now available pre-purchases of Eimear Noone’s Celtic-style Zelda album, in digital format. Now, a preview clip of one of the album’s songs has been put up on YouTube. The song is their cover of Majora’s Mask‘s Deku Palace theme, and it is quite easy on the ears. At first, this will feel like a very familiar cover of the original song, but not half-way through the video, you can tell that they went to new places with each piece. I am eager to see what strange and interesting twist they put on songs that do not match the Celtic style as well as this one. As was stated in the previous post about this album, pre-purchaces are now available with bonuses, and the album will be released during the 2015 Dublin International Game Music Festival, happening from April 29 to May 1. Are you excited to hear what this album has to offer? What other Zelda songs would you like to hear in this Celtic style? Drop a comment!